Within weeks of the launch of Percheron, the second Darwin 86 expedition yacht, Cantiere delle Marche is back in the news with the announcement of another contract, this time for a yacht from its new Nauta Air series. This series of 25 to 35 metre expedition yachts is designed by Nauta Yacht Design. Built in aluminium, the yachts offer large volume and modern styling combined with a fuel-efficient seaworthy hull. The new contract is for a custom version of the Nauta Air 80, with a modified sun deck, an interior alteration creating private access to the master suite and an increased length of 26.2 metres, making it a Nauta Air 86. 'Unlike any expedition yacht I have ever seen in this size, the Nauta Air 86 has stylish lines making her refined and elegant looking while remaining a true blue water cruiser. I am totally satisfied and proud of the customisation and I am sure this will make my first custom yacht extremely comfortable,' declared the future owner. The standard version of the Nauta Air 80 accommodates eight guests in four cabins: a master, a VIP and two twins. And she's powered by twin 588kW Caterpillar engines giving a top speed of 18 knots, a cruising speed of 16 knots and a range of 2,000 nautical miles at 12 knots. Sold to an Australian citizen living in Asia by Lee Marine, distributor of Cantiere delle Marche in the Asia-Pacific market, the Nauta Air 86 is the seventh contract for this young Italian yard in less then 24 months. 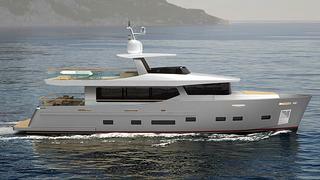 The yacht is scheduled for delivery in June 2014.